Legends say London was founded on words of a goddess. According to Geoffrey of Monmouth in his History of the Kings of Britain, the Trojan hero Brutus sailed to England and founded London - but it was the goddess Diana who told him to do so. When his ships stopped off at an island, he found a ruined temple to the goddess Diana. She appeared to him in a dream and said he would sail to a land beyond Gaul, settle there and find land inhabited by giants. He landed in Devon where, the story goes, he did indeed find and fight giants, capturing two of them - Gog and Magog. Brutus then travelled to what is now London and made his palace at the site where the Guildhall now stands. Although Brutus is legend, there are statues of Gog and Magog at the Guildhall and, in fact, a Roman amphitheatre has been found under the building. Brutus, being a Trojan, called London New Troy. The labyrinth was the symbol of Troy and, interestingly, there are labyrinth symbols appearing at Underground stations all over London now. 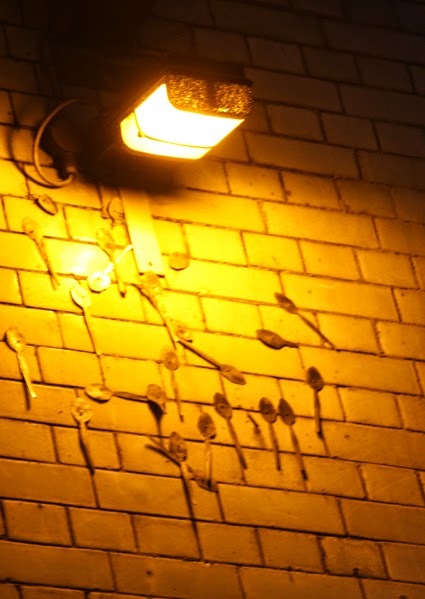 These are part of art project, but it is as if the subconscious of the people in the city are allowing that symbol to resurface, even if they are not aware of where the symbol came from. There are also legends that St Paul’s Cathedral is on a site of an old temple of the goddess Diana. St Paul stamped out the worship of Diana and destroyed her temples at Ephesus. It is debatable whether there was really a Dianic temple at St Paul's. Academics go to great lengths to say there was no temple to Diana there, but legends are persistent. A statue of the goddess Diana was found about 300yds from St Paul’s in the early 20th century when rebuilding Goldsmith’s Hall. Also, a broken statue of Diana was found at the Guildhall. In 1634 the Bishop of Norwich wanted money to repair St Paul's and used the legend of the Dianic temple as part of a fundraising campaign. He said the cathedral had replaced a shrine to Diana, and St Paul had been installed and Diana evicted. In one feast of commemoration of hunting that historically took place at St Paul's, a stag was paraded around the church, killed and its head put on pole before the rest was roasted for a feast. The cult of Queen Elizabeth I is also intriguing. 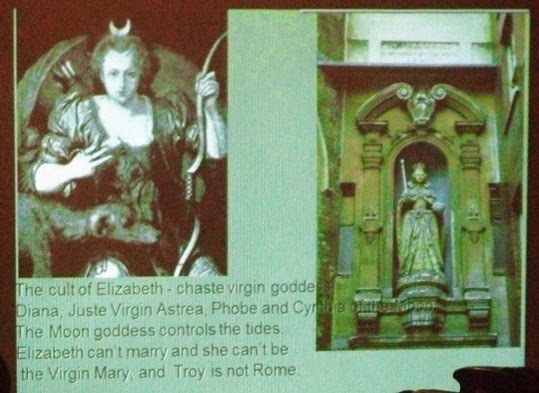 She could not marry because many Continental royalty were Catholic, but as she got older and would obviously be childless she was cast in roles of the virgin goddesses Diana and Phoebe, the chaste moon goddess, because that was less blasphemous than envisaging her as the Virgin Mary. The statue of Elizabeth at St Dunstan’s has moon goddess symbolism, while poetry written to her at the time saw her as a moon goddess too. In the 20th century parallels were drawn between the goddess Diana and Diana, Princess of Wales. The Cosmati pavement in Westminster Abbey is the spot where royalty are traditionally crowned. It represents Christendom radiating outwards as well as the elements and the cosmos. Charles and Diana's wedding was switched to St Paul's at the last minute. Caroline Wise said that from that moment, "The mythos went wrong". Princess Diana found out the night before her wedding that her husband was having an affair. Caroline said: "I wonder if the reason the venue was switched was because Charles did not want to stand on the Cosmati pavement and lie in his marriage vows." We all know the tragic story of the end of Princess Diana's life - she was hounded by photographers and died in a terrible reversal of the story associated with Diana, goddess of hunting. Caroline summed up by saying there is no reason there wouldn't have been a Roman temple in the middle of the city. She said: "Whereas the goddess Diana was consciously invoked in Elizabeth I by people because it was right for the time, perhaps it was not right for Princess Diana, as the story all went awry." You can read more about London's goddesses in the Guide to Legendary London, which Caroline contributed to. Shrines created unofficially by grieving members of the public after someone has died are a modern phenomena. We see them everywhere these days, often things like flowers tied to lamp posts and broken bicycles by dangerous roads. Harking back to Caroline Wise's topic, the biggest version of these public shrines was when Princess Diana died. Peter Watts said he walked through Hyde Park shortly after her death and the closer you got to Kensington Palace the more flowers you saw. He said: "There was a a waist-high carpet of flowers. They were rotting in the heat of the summer and people were wandering around looking at labels." Peter said he found it incredibly powerful, but also seditious.There was a lot of talk in the press about how the royal family were not paying attention to what people felt and that this shrine was in a way revolutionary. There are these types of public shrines to famous people including rock stars, There is one outside Amy Winehouse’s home, one at Freddy Mercury’s house. Abbey Road is a shrine for the Beatles. Mark Bolan has a shrine at tree he crashed into. There is an official statue there now, but Peter felt that detracted from the sentiment in the unofficial memorials. There are some similar shrines in history, Bayswater Road Convent has a basement chapel in which the walls are covered in relics - body parts such as bones and of Catholic martyrs hanged at Tyburn. There is also a replica of a gallows. You will often find coconut shells in the canals of west London, close to Southall. These are a Hindu offerings to Ma Ganga; coconuts are seen as the fruit of the gods. Graffiti shrines – street art – commemorate things like the Battle of Cable Street. Sometimes councils take exception to street art and remove it. The subject of leaving things like flowers, ribbons and other memorials to create unofficial shrines is controversial. Some see it as leaving rubbish and creating a mess, but others see it as the public making sure their feelings - often of grief - are noticed. These shrines are in a way an act of sedition and rebellion, and very powerful. Crossbones Graveyard is perhaps one of the finest examples of ordinary people creating a shrine that has gone on to become a lasting memorial. 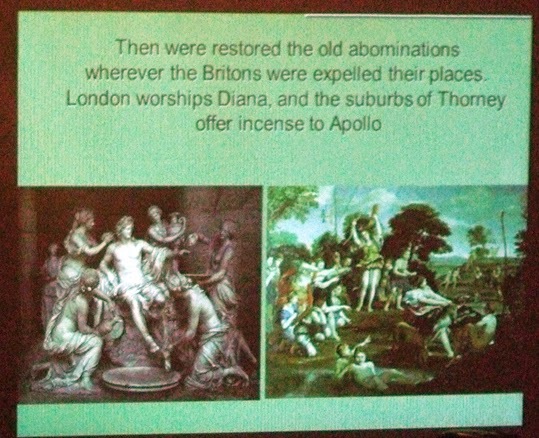 This was what John Constable, who started the shrine to prostitutes and paupers in Southark, talked about. The Southwark Mysteries was written by John Constable in his shamanistic persona of John Crow, after being inspired by the Goose - a spirit of the Winchester Geese, as the prostitutes of the area around Southwark Cathedral were called. 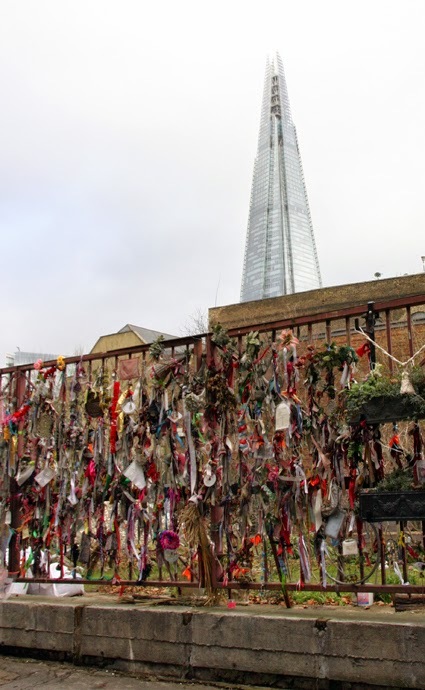 Although he had researched Southwark and the borough and knew about Winchester Geese, it was only after being inspired to write his first poem that he found out about Crossbones Graveyard, the unmarked and unhallowed land on which the poor of the area were buried in times past. His attempt to raise awareness of this broke out of a literary form into a reclaiming of the site that was being used to build the Jubilee Line Extension. During the building work, many skeletons had been dug up and destroyed. John Contable and other felt this was wrong. Little by little the work began to create a shrine for the outcasts. Events such as Halloween at Crossbones and other performances took place to remember and revive the spirits of Crossbones. John Constable said he felt called beyond the role of writer. He began holding rituals on the 23rd of every month to honour the Goose at the gates, and these ceremonies still take place. The gate are a shrine to the outcast dead, and now the outcast living too. People have hung ribbons on the gates over the decades since the ceremonies began. After many years of being a protest shrine, London Underground has taken the idea of creating a permanent memorial on board. Recently it has moved the gates to a better position and a garden is being officially created beyond them. John Constable said that the gates are a dividing space between the living and the dead. For many years Crossbones was a guerilla garden; unofficial. Transport for London has now granted a three-year lease to BOST and work is going on to create Crossbones Garden as a public space. John Constable said: "I am pleased, but there is a double edge because there is a sense that it becomes mainstream and some of the magic is lost. It seems to me that this is the way this had to happen, it was only viable with the support of the community and a truce with the underground." Someday I hope to make it there.